Akly JOULIA, born in his mother's encampment at the gates of the town of Agadez, dreamed throughout his youth of the distant and mysterious Tenere described by his people. He first traveled through this area as a geologist, then came to know it as a driver in the strenuous Paris-Dakar rally and most recently as an airplane pilot. 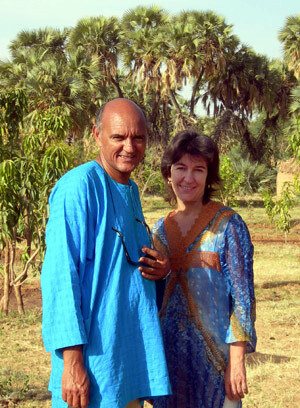 His meeting with Céline BOILEAU, a Frenchwoman working on development projects in the north of Niger and herself fascinated by the region, convinced him to share his love of the desert with the rest of the world. Celine speaks English, German, Tamashek and Hausa and has a diploma in tourism. Home. Hotel. Travelling. Coming to Niger. Sahara History. Céline and Akly. Contact. Site Info.